Cooper Sirmon (center with red hat) focuses on shooting his first arrow of his practice round. 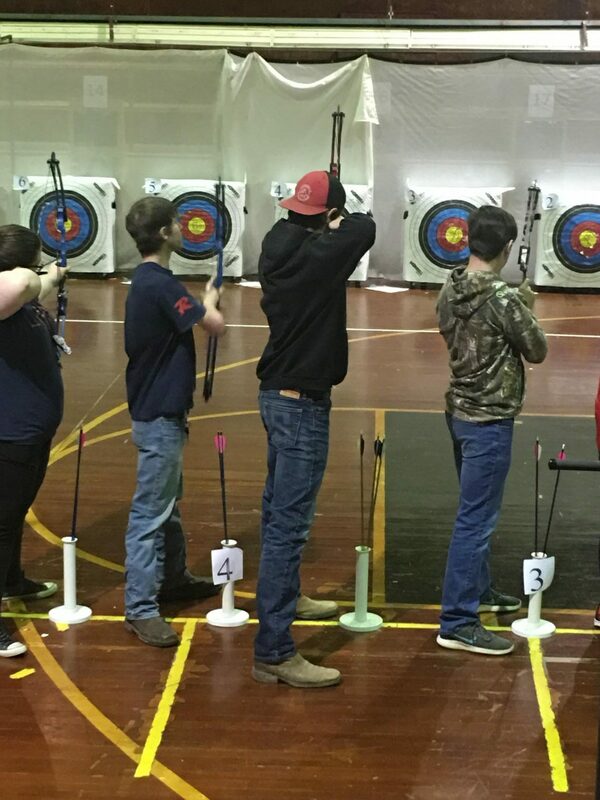 With their stomachs in knots, palms slick with sweat, and their hearts in their throats, the Pelahatchie High School archery team walk into the Forrest County Multi-purpose Center for their south state tournament without much to say. The nervousness is palpable. They walk quietly to the floor, preparing both physically and mentally, to shoot. Caden Stansbury, the future captain of the archery team, felt very uncomfortable. “I’ve been nervous in competitions before, but this one was different. I’ve never been so self conscience in my life. Everyone looked so prepared and professional,” said Stansbury. The whistle blows, the shooters take aim, everything goes silent, and then the shooters loose. The sound of the arrows hitting targets is nearly deafening. And just like that, the team relaxes. Carmen Hamilton, the team’s co-captain, felt an immense relief. “I got back into my element and didn’t feel nervous anymore,” said Hamilton. The team tries their hardest, taking their time and trying to score as high as possible, in the hopes of making it to the state competition. In order to qualify for state, a team must place in the top ten out of fifteen. Ever since Pelahatchie got an archery team they have not made it to state, and sadly this year is no different. Usually the team is in last place, but this year, the team managed to move up three places, only about 200 points from making it to the state competition. Levi Goldman is looking forward to next year and the new archery team’s potential. “I hope that next year everyone will learn and practice more because if they do then I don’t doubt that we will make it to state,” said Goldman.